GALO: Apart from being an artist, you are also an art teacher at Perryton Junior High School in Texas. Apparently, you keep some of your pumpkin carvings in the classroom and interchange them with a new creation once one starts to disintegrate. What are students’ and faculty reactions to these creations and have they ever brought in their own pumpkins for you to carve or perhaps had asked you to teach them? SC: I do display some of the pumpkins in my classroom. More recently, interested parties claim the carvings before I can display them, so I don’t have as many in my classroom as one might assume. 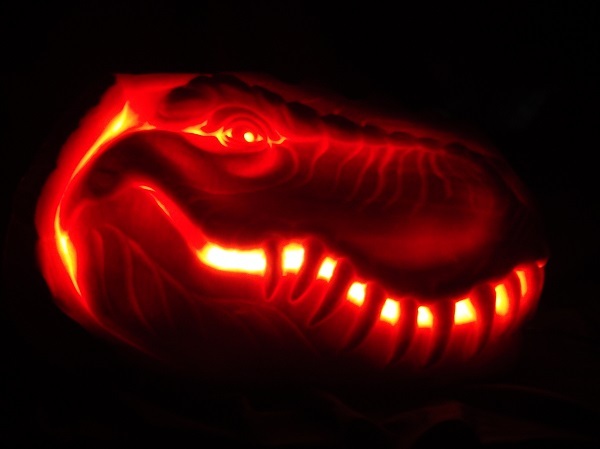 It happens less now, but there are still a few who inquire about having a custom pumpkin carved. I made a decision many years ago that I wanted to keep carving them for fun and not turn it into a job. It’s a short season and I only carve in my free time. One can imagine that I would easily book myself out of carving for my own enjoyment very quickly. I do book the occasional event at which I perform live carving for entertainment purposes, but no more than a couple during the whole season. I teach middle school and, due to the sharp tools involved, I have never ventured into the teaching of pumpkin carving as a class endeavor. GALO: Speaking of school, you do a lot of the carving in the building after school hours. What’s more is the carving essentially takes you no more than an hour or two to complete — a remarkable feat given the attention to detail you give almost every piece. Why do you choose to do a lot of your carving on the school grounds, instead of at home or in a personal studio? And is two hours nearly enough time to complete a piece, or do you find yourself coming back to it and adding in some features? SC: Due to the immediate onset of drying and deterioration, coming back to a carving wouldn’t be an option. Essentially, you set down to begin the carving and an hour or two later, you’re done. The few times I allowed myself to carve over two hours on a pumpkin, I wasn’t happy with the changes in the rind and how it responded to my tools. I’m not equipped to describe what is actually happening, but the sugars and acids in the juice of the rind do some odd things to the consistency of the material after a while. I probably carve as much at other locations as I do in my classroom these days. I enjoy using my classroom simply because it’s only a few blocks from home and the lighting is good. The apple eye carving by Scott Cummins. Photo Courtesy of: Scott Cummins. GALO: Looking at your 2013 creations, the two pieces that seem to stand out the most are “Phil Pumpkinson” (who, one might say, resembles an angry Santa or a disgruntled logger, complete with the beard, mustache and the base of the hat), and the pumpkin face who appears to be in a screaming panic as a tiny bee has perched itself on its nose. And then, of course, there is the apple eye glancing sideways at the viewer. Could you tell us a little more about these carvings – where the inspiration for them came from? 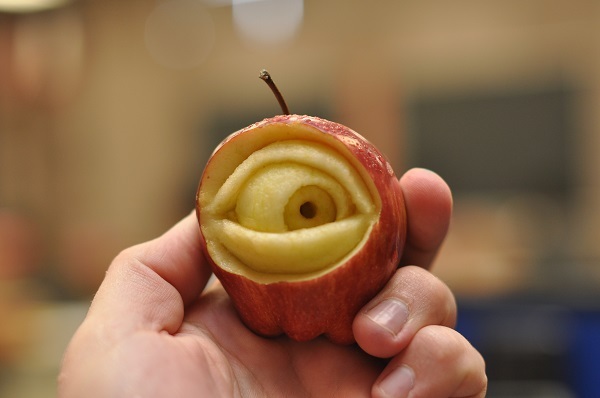 Was the apple carving a potential pun on the “apple of my eye” saying? SC: Phil Pumpkinson is a caricature of Phil Robertson on the popular Duck Dynasty series on A&E. The apple carving came about because I was anxious to get started, but I am at the mercy of the pumpkin suppliers as to when they will be available. When I carved the apple, I still didn’t have access to pumpkins. It carved similar but the shavings tasted better than chips of pumpkin. GALO: I noticed you draw a lot of your inspiration from popular culture. Is there some face or subject you haven’t sculpted yet, but are dying to try? SC: At times, I’ve kept a list of carving subjects I’d like to try. Lately, perhaps I have been too busy because I have just been coming up with something after I sit down to a pumpkin. I think the list was better so maybe I should get back to that method. “P-Rex” by Scott Cummins. Photo Courtesy of: Scott Cummins. GALO: Some of your work has a glowing effect to it, accomplished by a 30-watt bulb and a drop light, such as with your “Wolf” piece from 2007 or your “P-Rex” from 2009, which creates a certain mystery and eeriness. Have you considered using shading or colorization techniques to accomplish more depth and character with some of your more intricately detailed pieces (such as what one might see on the show “Halloween Wars” on the Food Network channel)? SC: I have seen a lot of growth in the pumpkin sculpting phenomenon in recent years. There are plenty of different artists developing their own styles and techniques. I find that my interests are centered more on working with the pumpkin in its natural state. Regardless of the obvious merit of such mediums, I don’t have much interest in paint, dye, or elaborate assemblages. When I see a carving that is no longer recognizable as a pumpkin, such as carving the orange skin away entirely, it loses appeal for me. It is important for me to see the pumpkin intact. 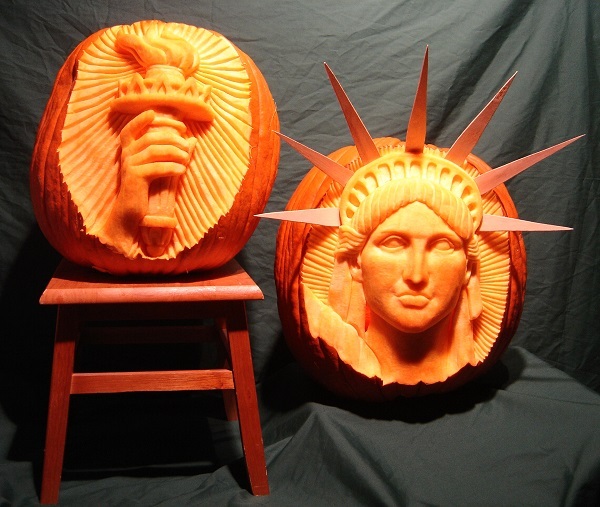 A carving of the Statue of Liberty by Scott Cummins. Photo Courtesy of: Scott Cummins. GALO: When one flips through your gallery, they will notice that every sculpture is practically of the face, whether it is the Mona Lisa, the Statue of Liberty or Pimplekin. Why do you focus on only this feature, and would you ever consider doing full-figured sculptures using a couple of pumpkins at a time, or even one? SC: My pumpkins are inspired by traditional jack-o’-lanterns, so I lean toward faces as my preferred subject matter. Then there are the expressive possibilities and connection with the viewer that can be accomplished with a face. That being said, I do occasionally venture into other types of subject matter when the mood strikes. 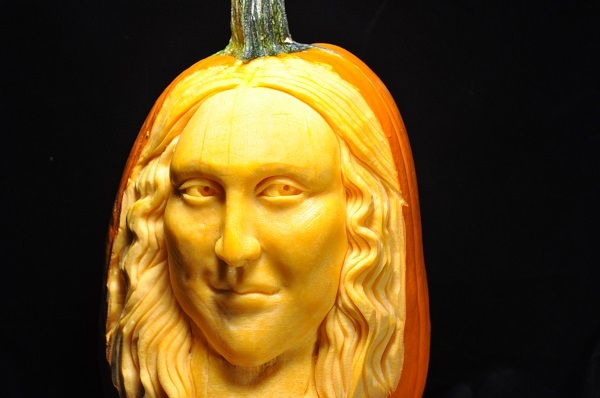 A pumpkin carving of the Mona Lisa by Scott Cummins. Photo Courtesy of: Scott Cummins. GALO: Halloween is right around the corner. What types of characters or faces have you planned out for this ghoulish occasion that have yet to see the tip of your carving tools? Will these be perched around your home, or rather outside, for all to see? SC: For me, Halloween merely amounts to a point of significant decline in pumpkin season. Sadly, it becomes pretty difficult to acquire pumpkins after that point. From that point of view, one could say that Halloween is my least favorite holiday. At this point in the month, I’ve often already carved any ideas I might have planned. From this point forward, I typically need to get that pumpkin in front of me and then make the decision about what face I think it needs. For more information regarding Scott Cummins’ artwork, please visit http://www.pumpkingutter.com/. 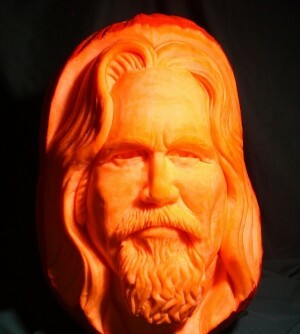 Featured image: “The Dude” from “The Big Lebowski” carved by Scott Cummins. Photo Courtesy of: Scott Cummins.